The new structure of DIGI-KAST allows it to control up to four warp beams fully independently, either from each other or in a synchronized mode. This results in considerable cost reduction when working with more than one warp beam. 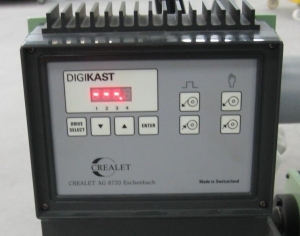 The DIGI-KAST let-off control unit optimizes the weaving procedure and simplifies operation. It also has a particular influence on the fabric quality and contributes to a regular weave structure. This control system can be used as a retrofit set for weaving machines with conventional warp let off devices or for new weaving machines. The control system is equipped with dozens of function parameters that allow it to be optimally adapted to the widest range of fabric types and weaving machines. Faulty operation by unauthorized persons is avoided by the fact that certain parameters can only be modified using a password. If any fine adjustments are needed, these can be made when machine is running. As soon as a machine run signal between 10-48 VAC/DC is available, the control system is in weaving mode. During this process the let-off will keep the position of the back rest roller at its reference setting and thus maintain the warp thread tension at a constant level. The position of the back rest roller is measured by a linear proximity sensor. If the weaving machine run signal is set back, the let off speed ismemorized. As soon as there is a signal between 10- 48 VAC/DC available, the control system is in slow motion mode. During slow motion operation, the warp let-off turns at a speed proportional to the let-off speed lastmemorized. The factor of proportionality can be set using a parameter. If the two keys for manual operation are pushed simultaneously, the whip roller moves to its reference setting even whenweavingmachine is not running. Pick finding mode can be selected from an external position. Electronic pick finding is done independently from the weaving machine. The warp beam can be wound and unwound by handwith two keys. The external control panel can be mounted at weaver’s position and offers the advantage of manual operation for let-off from this position. Our customers use DIGI-KAST to produce all kinds of specialty fabrics like such bands.